Rental items available are across a variety of categories including furniture rentals, household appliances, laptop, tablets and computer rentals, and TV rentals. 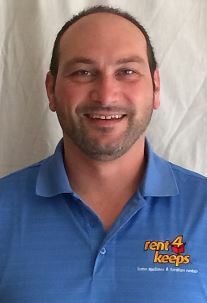 Anthony is your local rent4keeps Glenroy representative and he will help you with all your rental requirements. rent4keeps Glenroy services the following surrounding areas: Broadmeadows, Coburg, Pascoe Vale, Dallas, Moreland, and Oak Park. The rental option is a great way to get the latest household and technology products. All our products are brand new and of the highest quality, or you can choose to rent any new product from any supplier. Best of all when your rental agreement ends, you get to rent for keeps. rent4keeps is a wise choice for first-time, and repeat rental customers because we are a fully Australian owned and operated company and we pride ourselves on the best service possible.